VRACHOS BEACH...The hidden paradise of Greece, beautiful beaches,crystal blue waters and evergreen forests. KOUROS HOTEL is built in one of the most beautiful beaches in Epirus, a warm, family hotel with all modern tourist infrastructure. Come and enjoy the endless blue of the Ionian Sea from our garden. Holidays here are a unique experience, marked by the aroma of olive trees, the cool sea breeze and romantic summer nights. From the first moment you are in KOUROS HOTEL you will see a warm and genuine smile that makes you feel comfortable, enjoyable and, above all, friendly. Kouros Hotel has the most modern facilities and services. There is a reception desk operating, to which you can address for all your needs. There is a café-bar, a private parking, sun beds and umbrellas on the beach, where you can have a drink from the bar. 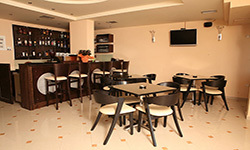 All rooms are equipped with microwave oven, toaster, kettle, fridge and the necessary dinnerware(utensils). There is also TV, air-conditioning and telephone. The main features of our rooms are comfortable space and large verandas with a small table and chairs,so that you can enjoy the view and the sunset from your room. In the matter of cleanness we are particularly sensitive, cleaning on a regular basis, changing the bedding sets, garbage bins and cleanness on the beach(Cleanness equals culture, after all). For more information on the services provided contact us, it's our pleasure to assist you. P.C. 480 62 Epirus, Greece. Post by Kouros Hotel vrachos.